NO ELBOWS are Allowed In IKF Junior MUAY THAI Bouts. MUAY THAI Throws are LEGAL in IKF Junior MUAY THAI. NOT HIP THROWS. In TRUE MuayThai as with these rules, FLASH KNOCKDOWNS where the knocked down fighter rises up immediately after being knocked down are NOT COUNTED AS A KNOCKDOWN OR STANDING 8 COUNT. Shorts are mandatory under IKF MUAY THAI RULES. This will curtail the crowd from yelling at a fighter to "Stop Kicking To The Legs" which is often heard at ringside if the fighter is wearing Long Pants. MUAY THAI SHORTS ONLY! Not board shorts, mma shorts, wrestling shorts, etc. etc. 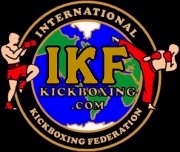 ALL EQUIPMENT Used by EVERY FIGHTER on EVERY IKF must be approved by the IKF. Nearly every weekend around the world there's a kickboxing event that advertises they will feature the long honored fighting art of Thailand known as MuayThai. If these fighters are both following true Muay Thai tradition, they will both enter the ring over the top rope. Why? In Muay Thai tradition, the Mongkon (headpiece wore around the top of each fighters head prior to their bout) is blessed for good luck by each fighters respected religion. Going over the top rope is symbolic that God is Above All Things such as the ring ropes. The spectators and their peers see 2 fighters dressed in the traditional Muay Thai shorts with their Mongkon wore proudly on their head. Once in the ring the traditional MuayThai music begins and a fighter has their first options of the bout. However in Thailand, this is NOT an option and SHOULD NOT be an option even in other parts of the world. These options are not fighting options such as "Should I throw a Jab or a knee etc." these options are the ones of long and honored traditions of Muay Thai. To seal the ring (The walk around the ring which symbolizes the sealing of evil spirits from the ring), begin their Wai Kru (Wai means Bow and Kru means Teacher. When the fighter bows down paying homage to their teacher, club and family) and or a Ram Muay. (Which translates into boxer dance) or to simply stand and await for their opponent to be ready and the referee to begin the bout. Keep in mind that not all Muay Thai fighters perform these things. Even in Thailand, they are a fighters choice. If a fighter decides to seal the ring we'll see them stopping to pray in each corner. In Thailand, the Wai Khre is paying homage to their Buddha. This pray continues at each corner during their walk to all four corners. Once again, a fighter may now choose to perform a Wai Khre followed by their own version of their Ram Muay. Often during a fighters Ram Muay, many true fans of Muay Thai fighting may not know what the dance is for. To answer this question, the dance expresses a fighters balance and agility. Sometimes at it's end, it may be followed by a show of confidence or challenge towards their opponents corner such as a stomping of their feet or an imitation of shooting an arrow at their opponent. To true fans of the sport, this is all part of the bout as well. As each fighters rituals ends, the trainer removes their Mongkon and turns to face their opponent.